A Canadian guy can do Beyonce better than Beyonce! 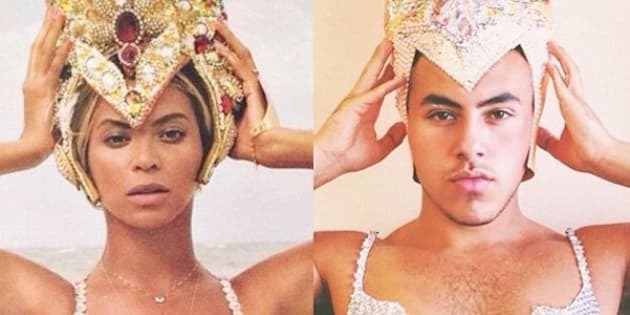 Mina Gerges, who hails from London, Ont., transforms himself into pop divas on his Instagram page, and the results are nothing short of spectacular. Mina, who attends Western University, told Buzzfeed that all of his outfits are DIY. "I make everything myself," he said. "I purchase curtains and hold them with pins, and everything else I put on them I stick with glue." Each photo takes about two hours to create. He makes a hot Kim Kardashian, no? I finally figured out how @kyliejenner makes her lips look so full! Lots of paint.